I’ve turned the regular fluctuation of gas prices at the gas station fairly near our home (the one mentioned yesterday) into a game of sorts with my oldest son. Simply put, we’ve started tracking the data. We watch for the price of gas on that sign each time we drive by it, then we mention whether it has gone up or down recently. 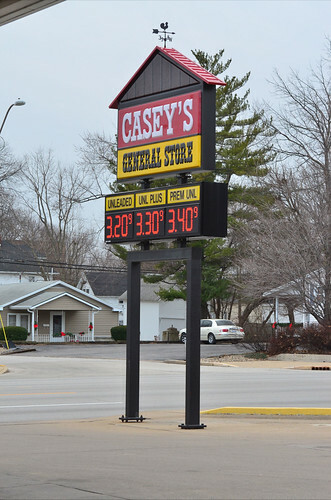 We also talk about whether or not the price is low enough right now to stop in and fill up. We’ve even started tracking and recording this data a bit. We do the same thing when we see gas stations in other towns, comparing them to the prices at home. It’s a fun little economics game, but it has some real value, too. I’m cluing him in on many of the things he needs to know in order to maximize his value at the gas pump when he’s old enough. If you can save $0.10 per gallon of gas, filling up a typical sixteen gallon tank saves you $1.60. Do that consistently and you’re talking about a significant difference in your annual fuel bill. So, how do you shave off that $0.10? There are a few things you can do to make sure that you’re putting the least expensive fuel option into your tank. For starters, know what your car needs. Very few cars need the premium fuel or can even utilize it to any degree of effectiveness. Take a peek in your car manual (see, there it is again – your manual is really useful) and see what type of gas is suggested. Most modern cars simply suggest using 87 octane gasoline, which is the “cheap” stuff at the pump in many states. Choose the gas type that’s cheapest at your pump that meets the minimum suggestion from the manual. Never drive significantly out of your way to get cheaper gas. My rule of thumb is that I have to be saving at least a dollar in my tank for every mile out of my way that I drive. Since my vehicle has a sixteen gallon tank, I’m looking for a savings of at least $0.07 a gallon for every mile out of my way that I drive. Why? Even in perfect traffic, that’s still two miles (one each way) of driving in town, which will take at least five minutes with the risk of significantly more time, plus the gas you use to make that extra jaunt, just to save $1. You’re quickly getting below a rate of $10 per hour in savings. Don’t be brand loyal until you’re familiar with the prices in your area. For the most part, the gas stations in your area are going to be pretty consistent with each other. If there are one or two stations that are a bit lower, they’re going to consistently be a bit lower. Spend some time studying the prices in your area, particularly along your commute, so that you know what the prices are, and consistently visit the station with the lowest prices. After a while, you’re going to regularly find yourself using a single station or two, so get a rewards credit card associated with that station. Use it only for gas there. Typically, rewards cards associated with gas stations have really nice rewards, but only on gas bought at the stations in that chain. So, don’t use the card for anything but gas, and pay the balance in full each month. This will often get you a very nice price on gasoline. You should also check your local warehouse club for gas offerings. The local Sam’s Club in our area offers gas prices substantially below other chains if you’re a member. Since we are, we often utilize Sam’s Club for gasoline. If you’re a commuter, shaving a bit off of the price of a gallon of gas can help a surprising amount over the long haul. It’s one of those little changes you forget about until you find yourself breathing easier with regards to your finances.